Cookware sets are a cost effective way of getting all your must-have cooking equipment in one easy, good value purchase. And instead of having to find, match, and buy pots, pans, and saucepans separately, a good quality set is a hassle-free investment that will last a lifetime. Whether you are upgrading an outdated set or are moving into your own place for the first time, this comprehensive shopping guide will help you easily sort through the overwhelming amount of options to find the absolute perfect set for you. Stainless Steel Cookware Sets: Stainless steel is not only durable but also very low maintenance, and even in high temperature situations (like searing your steak to perfection) they can withstand the heat. Because they are rust resistant and don’t react with foods, they are suitable for a wide variety of foods. As an added bonus, most sets are dishwasher safe. Ultimately, they are a great long lasting set that are great value for money for first time buyers. Copper Cookware Sets: Copper cookware provides excellent heat conductivity that cooks food evenly. The exact temperature control of these sets make it possible for cooks to whip up even the most complicated recipes. Because of their strength and longevity, copper cookware sets are an investment and an ideal upgrade for the avid cookers. Aluminium Cookware Sets: Aluminium cookware offers the most competitive cookware prices, and because these sets still conduct heat like a pro, they are great value for money. They are lightweight, which makes using and cleaning easier, and very versatile. Ideal for first time cookware set buyers looking for a low cost set to get them started. 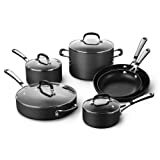 Cast Iron Cookware Sets: Cast Iron is a stable and favorite cookware material that is known for good heat distribution and even cooking. Cast iron sets are non-stick without needing an extra chemical coating, and they therefore enjoy good longevity. Ideal for simmering and cooking over extended cooking times, these sets often come with an enamel coating which enables cooks to use them on the stove and in the oven, giving you much more functionality for your money. Ceramic Cookware Sets: Ceramic cookware sets can withstand very high heats and therefore are often used on stove tops and in ovens. With the added bonus of being microwave and even freezer safe, they offer cooks unprecedented versatility. Their non-stick surfaces make them easy to clean and their coating make them easy on the eye. They are a high quality cookware set investment for larger kitchens. Titanium Cookware Sets: If you're looking for cookware that has the strength of steel and lightness of aluminium, titanium cookware is what you are looking for. Heating up quickly and evenly, they make cooking efficient. They are not only nonreactive, but their titanium build makes them scratch and dent resistant, too. Titanium cookware is non-stick and therefore requires little or no oil, and cleaning can be as easy as wiping it clean with a cloth. These high quality sets are a sound investment and their units can stand the test of time, and a busy kitchen. Tri-ply Cookware Sets: This cookware has an aluminum or copper core wrapped in two layers of stainless steel and therefore offers the versatility and longevity of steel with the good heat conduction of copper. Some sets can be used both on the stovetop and in the oven! Because these high quality sets offer the best of both worlds, they make cooking and cleaning easy, without compromising on heat. 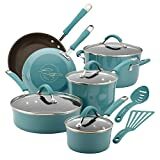 Porcelain Enamel Cookware Sets: Porcelain cookware sets are normally cast iron or carbon steel that have been encased in porcelain enamel. 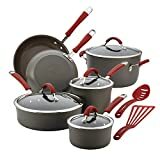 Combining cooking technologies, these sets are a breeze to clean and don’t react to food (like ceramic pots) and require much less oil and seasoning (like cast iron sets). 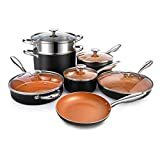 Coated Cookware Sets: Cookware can be coated with the following nonstick materials: calphalon, circulon, teflon, tefal, silverstone, and anolon. Sets with coatings are ideal for foods like pancakes, egg, and fish that are a little more delicate and make it possible to use little or no oil at all. Cleaning: Owners rate cookware sets highly if they are easy to clean. Non-stick surfaces and pieces that are dishwasher safe are reviewed well and are worth considering. Accidents happen and food burns, and having cookware that is not damaged by this and can be easily cleaned will ensure your cookware set is a lifelong investment. Build: Reviewers note things like quality handles and sturdy builds as important factors when rating their cookware. Sets with quality handles that are easy to hold and durable are crowd pleasers, and sets that can not take accidental bumps get rated poorly. Material: Cookware material is a big review point by consumers. 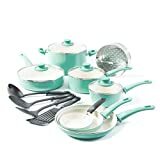 Sets that are non-stick allow for little or no oil and have big appeal to their health conscious owners. Materials that heat quickly and evenly are enjoyed by novice and avid cooks. Style: Owners not only value cookware sets that look good and match their personal and kitchen style, but they want their cookware to keep its shine and looks for longer. Finding a cookware set that fits your taste and has a quality build is the ideal purchase, especially if you are opting for a set that you will hang and display. One of the first things to do is consider what stovetop you have. Induction cook tops will need magnetic material cookware, like your 18/0 or 18/8 stainless steel and cast iron ware. Electric range smooth top stoves require pans that are flat bottomed, so make sure that’s a characteristic of the set you’re considering. Standard gas stovetops should be compatible with any cookware material or shape. Another key concern is cooking performance. A good quality pot, pan, and skillet should heat evenly, constantly, and sit firmly on the stove to ensure efficient cooking. When deciding, look at how many pieces they are offering you. Higher quality sets may offer fewer pieces, but at a higher quality and are ideal for already established kitchens looking for long lasting cookware. Bigger, better value sets will include much more so that you get everything you need to stock your kitchen - giving you much more for your buck. How much kitchen cabinet space do you have? Cookware that are designed to be hung up on walls, racks, or ceilings are an ideal solution for small apartments. Alternatively, cookware that can be used both on stoves tops and in ovens means you will only need one set for all cooking needs, and will therefore need less space. On average, a cookware set should at least include an 8 inch skillet, 2 and 4 quart saucepans, and a stockpot. For bigger families, look for a set that includes a 10 and 12 inch (instead of the 8 inch) skillet as well as a dutch oven. These added pieces will be well used and are must-have cooking tools for bigger meals. Cookware that is naturally non-stick, like ceramic, has a longer lifespan than a low quality coated set might have. For coated, choose a reputable brand to ensure quality of the non-stick surface. When it comes to cleaning, opting for a dishwasher safe set will save a lot of hassle. For better longevity, non-stick materials are easier to clean, and washing by hand will ensure you will have many more years of cooking in them. When considering the material of the cookware set, take note of what accessories you have already at home. Some materials and coatings, like teflon for example, will need plastic cooking utensils. Different cookware set materials offer different weights. Cookware should be substantial and heavy to ensure they keep from denting as well as hold cooking temperatures well. Handles are an important consideration when picking your cookware set. A good quality set should offer handles that are comfortable to grip and strong, so as to prevent accidents and make moving them around easier. If you would like to use your pieces in both the oven and on the stove, steel handles are your best choice. Cookware that offer handles that are cool to touch while cooking are a great convenience to cooks. Tri-ply stainless steel cookware, with either an aluminium or copper core, are the perfect cookware to braise and brown in. 18/0 stainless steel does not contain nickel but is rust resistant and is cost effective. It is as easy to clean as other grades and make a great starter set. 18/8 stainless steel is mid way between 18/0 and 18/10 grades in terms of heat conductivity and shine. They are non magnetic, rust resistant, and easy to clean. 18/10 stainless steel offers the best steel shine, rust resistance, and durability. Easy to clean and made to last, these are the highest quality steel cookware sets you will find. Non-stick cookware are great for people watching their calories, as they require less oil. They also require less strength to clean than other kinds of cookware. 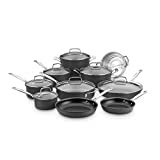 Cast iron cookware can be used to braise on the stove for long periods of time, as well as for baking as most of these sets can be used on/in both stovetops and ovens. Aluminum cookware sets that are anodized don’t require delicate handling and are versatile. When choosing cast iron or copper cookware sets, following their maintenance schedule will make sure your pieces will stand the test of time. Cuisinart: Formed in 1973, Cuisinart is a cookware leader that is universally known for their quality kitchenware, and is recognized by culinary connoisseurs as a quality cookware brand. 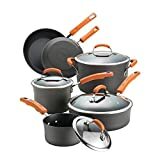 Cook N Home: A renowned brand in kitchenware, Cook N Home has a reputation for providing superior grade cookware at competitive prices. T-fal: Pioneering the first non-stick frying pan in 1954, T-fal has grown into one of the world’s leading cookware suppliers, all designed to make consumers’ lives easier. Emeril’s: Emeril is a world renowned chef, restaurant owner, businessman, and cooking show host who teamed up with T-Fal to supply quality cookware.